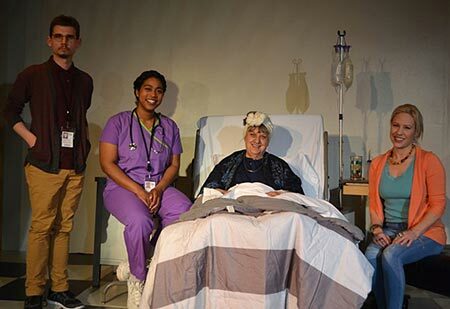 Aiesha Watley as Nurse Tina sits beside the bedside of Linda McDonald as Maxine while Todd (Cam Taylor) and Maxine’s daughter (Katy Hughes look on. Carpenter Square is presenting “Death Tax” the popular new play by Lucas Hnath. While Hnath is clearly a fine writer, his style is particularly difficult when translating to the spoken word. Specifically, his dialogue, and much of the play, consists of speech making by the characters rather than conversation. The intensity in emotion is handled well by all the actors in both speaking and listening, yet they are unable to respond naturally. Mark Fairchild directs for the second time at Carpenter Square. As a new young director, his growth is significant and he shows a great deal of promise. Unfortunately, this show presents an insurmountable difficulty for a director to overcome due to the convoluted style of Hnath’s writing. Nevertheless Fairchild makes a heroic effort which pays off in the long run. Fairchild has the advantage of an excellent cast, familiar with the complexities in differing author styles. Linda McDonald, Cam Taylor, Aiesha Watley and Katy Hayes have six roles in the show. “Death Tax” is about an elderly woman convinced her daughter wishes to hasten her death to avoid the increase in the inheritance tax that is to take place at the beginning of the year. While it seems unusual to the nurse, it is well known in life that dementia patients frequently suspect their nearest and dearest of the worst kind of dastardly crimes. Linda McDonald plays the elderly woman, Maxine, with her usual consummate skill. Maxine conspires with Nurse Tina to foil her daughters plotting. 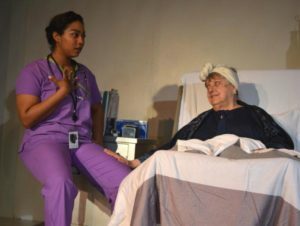 Aiesha Watley plays the Nurse with some skill, but little empathy. Katy Hughes plays the daughter who is innocent of such a terrible desire nicely. It is easy to see that the daughter has not been the best of children, but she wishes to reconcile with her mother, who is not exhibiting her finest hour of motherhood. Cam Taylor plays the supervisor, Todd, who reluctantly partners with Nurse Tina; he’s willing to risk his reputation for the woman he wants to impress. Together the two play a desperate game with both the elderly Maxine and her daughter. In the final scene Watley and Taylor portray different characters, Charley and Candice, that are an interesting juxtaposition to Nurse Tina and Todd. Taylor does a particularly nice job with his role as Charley and Watley is also more believable as Candice. However, Maxine remains a harridan. An important element in comedy is timing, and though “Death Tax” is publicized as a dark comedy, the author’s style gives the script a ponderous quality that is impossible to time. Some of the speeches are rather shocking and without the opportunity for a natural reaction the audience is left with a feeling of awkward discomfort. Many things are said that require a defense and no defense is made, rather like an exit line. Upon delivery of an exit line it is necessary to exit. “Death Tax” has no exit. Sartre would have approved. 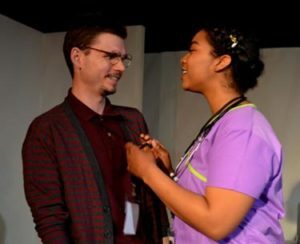 Aiesha Watley as Nurse Tina and Cam Taylor as Supervisor Todd conspire and reminisce about plans in “Death Tax”. In spite of the obstacles “Death Tax” is an excellent vehicle showcasing the talents of director and actors alike and is worthwhile from that aspect. It is a sensitive piece, and some people may find this treatment of the subject uncomfortable. “Death Tax” plays through April 20 at Carpenter Square Theatre located at 800 West Main in downtown Oklahoma City. For information visit www.carpentersquare.com or call the box office at 405-232-6500.